On the last Sunday of July, I went hill-topping with fellow trekkers and naturalists to Tung Fort. Our aim was only one, to reach the very top come what may. We braved against the torrential rains, rode through a horde of tourists at the much more coveted waterfalls around the fort, forged our way through loose rocks and narrow cliffs and came face to face with a thousand waiting soldiers themselves. Nothing, nothing faltered us, not the rain neither the road traffic. We began at 0600 Hours and reached the fort around 0800 Hours. It was a long drive through busy cities and deep valleys. Add some gray skies and bumpy roads, and you get a not-so-good start of what was expected to be a really exciting journey. Our mind pondered in depression, of whether we will see anything interesting, or even complete the trek. I was beginning to fall asleep already. I had to brave up to the sore throat and slight fever I had since the previous day. Whoever said that the journey matters more than the destination must have had considered an exception. And this was one. I’m not sure where the name ‘Tung’ comes from, but it is also called Kathin-gad, literally meaning Difficult-fort. This was basically the only thing I knew about this fort. We didn’t know if it was kathin because it was difficult to trek, of if it was difficult to capture. This suspense made Tung seem even more formidable, yet exciting. I was eager to explore a new place (not that I’m tired of visiting Yeoor Hills). There is something about trekking forts. Every time you see it from distance, and every time you inch in closer to the heart of the fort, you feel more and more like a conqueror. It is not surprising to see people wave their hands in glory when they conquer, rather reach the pinnacle. I, too, felt proud, but in reality, this place was already conquered by a hundred, to your surprise, tiny creatures barely the size of your little finger nail (we’ll find out why a little later). It was their territory, probably even before the human emperor reached the top of this fort. Once we reached the base, I was delighted to see the rain take a good day’s break. It was as if the clouds heard our prayers, but in reality it was so windy that clouds were pushed upward and away from this emergent fortress. In a way, it seemed as if the fort welcomed us. Not really us but our cameras, since we were going to conquer this fort anyway! So began our real part of the journey, and in this I agree with the phrase “it’s not the destination, but the journey that matters the most”, for our aim was not only to reach the end, but to explore the fort and observe the surrounding as carefully as possible. This Fort is unique, in the sense not many tourists flock to this place. So the paths are slowly recaptured by the flora. It is also unique because if the elevation. All the forts in the Sahyadri Ranges of the Western Ghats house many endemics, seen only on the cliffs of such steep high-rise terrains. And to our delight, they were all flowering. The inflorescence of Bananas is huge – over a foot in diameter, and attracts a myriad of insects and birds for pollination. Wild Bananas are annual plants, dying out during late winter, but surviving as a root in the ground, and growing new shoots at the onset of monsoon. This large leaved plant not only added beauty to the landscape, but served as a great canvas for photographing insects up close. These annual herbs are more so common in the northern Western Ghats, usually clinging onto large rocks with enough moss and algae growth to grab hold of the roots. We didn’t know what to expect inside the fort, which was, for most part, hauntingly beautiful. It turned into a spiritual experience, as much as this was a scientific expedition for us. I imagined horses riding in and out, of the large wooden doors supported by this stony edifice. The Fort then would have looked out worldly as it did that day. However, this is only one of the several avatars of the Dwar. In summer, it looks something like this. Thanks to my friend Dinesh Valke who was always doubtful of the identity of this plant. 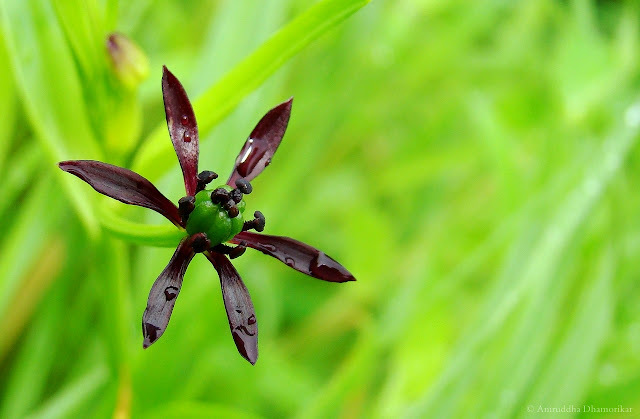 It is an endangered plant that is endemic to the Sahyadri ranges of the Western Ghats. They were fairly common, growing extensively on the steep side of the fort. We could only see them because of their unusual flowers. Ceropegia is an unlucky genus of plants in family Apocynaceae. Unlucky at least in the Western Ghats because of their delicacy, both in tolerance to pollution levels as well as a threat from over harvesting since their root is eaten. Therefore seeing one is a sure sign that the habitat is undisturbed and pristine. How many bees in this frame? It was not only surrounded by grasses, but Ceropegia, Habaneria, and a variety of other plants along its dripping walls. The water was alive as well, with dragonflies such as Red Marsh Trotter and female Darner laying eggs on the vegetable matter. 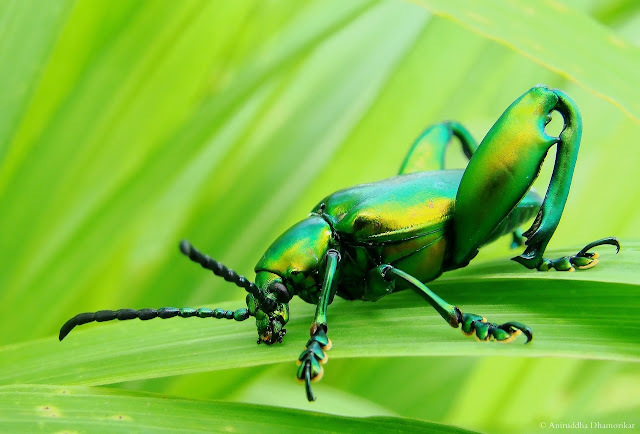 A Leaf Beetle - Chrysochus sp. It is a Fungus Gnat, in the family I don’t know. A male Stalk-eyed Fly who wouldn’t sit at one place on the leaf was also observed. A banana leaf, due to its large size, offers a best chance of photographing small insects since there isnt much clutter around, and instead of going for an awkward crop to avoid this clutter, your subject can occupuy a smaller area with a lot of negative space around. It is one of the ways to avoiding tighter crops, since tighter the crop, lesser the details in the subject. Once we reached the bottom, a local told us that a few enthusiasts lost their lives while trekking the fort several weeks ago, which is very unfortunate. I wondered if this was really a kathin Fort and that is why it is called so. While we did not find this trek difficult, it is definitely a steep climb for those who’re not used to trekking. But I do recommend those who’re interested in exploring the biodiversity of Monsoon to explore such places – but please, no picking or killing anything! By keeping this place as untouched as possible is the only way to ensure its conservation. I could not share all the pictures, nor could I write as much as I wanted to, since this has already turned into an overtly long report. We’ll look into the hill-topping behaviour and other interesting observations in much detail at the end of Monsoon. I’ll be writing every week this month, so do keep visiting! Liked this account, as well the beautiful photographs. This entire post just took my breath away. The beauty and wonder you show is outstanding. The wild banana looked a lot like an artichoke to me. Loved this post! I would absolutely love to spend a few days trekking through that area finding flies and taking photos! Absolutely gorgeous! Wonderful description buddy. The pics are simply breathtaking! Loved the pics...especially the close up shots are simply amazing with such clarity & details...what camera are you using?